They say it takes ten years of hard work for a one-hit wonder to sparkle briefly, and much more to keep the light shining. Hezron Clarke out of St. James, JA has worked consistently on a high level for longer than that. The crooner with the raspy timbre of Beres Hammond and the phrasing as elaborate and light-footed as Luther Vandross often gets compared to Mikey Spice. Wrongfully so, after all the oeuvre of the latter is patchier than Hezron's. That Hezron's well-deserved big breakthrough is still due is just another proof to the point that talent is just one ingredient among many others of success in the music business. Hezron has released an EP in 2009 (self-titled) and numerous singles (Think So In Love, Can't Come Between, Two Places featuring Shaggy) that made waves internationally, but never an album. The waiting is over finally, and I may tell you already that it might have been worth it. 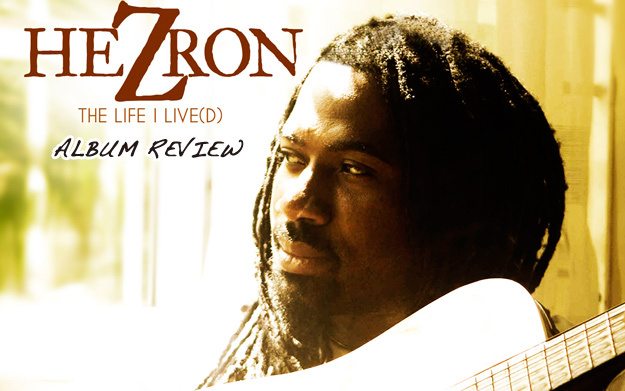 The Life I Live(d) is the title of his album debut that comes with two CDs that each contain thirteen tracks, underlining that Hezron has a history in recording music. No surprise that lyrics wise the Ladies are the center of attention. Whether in Two Places in which Hezron can't decide between two Ladies, or Mama and Superwoman, in which he expresses his unlimited respect for the mothers of our planet, or Her Single Right, an appeal to independence of single Ladies: Hezron always strikes a chord with the ladies, even when he tries to convince his lover not to leave him in Forever And Always with its nice zouk-infused synthesizer melodies. Welcome Home is the other track on this album that draws some inspiration from the French Antilles’ zouk – a natural combination I’d love to hear much more often. Welcome Home reminds the men to help their women with household chores (one's surprised that that still needs to be stated explicitly in 2014). Hezron doesn't restrict himself to lovers rock. “It's my duty as an artiste to sing about what the people are going through every day. We are all in the struggle together, and I can feel their pain”, he recently told the Jamaica Gleaner. Together with the one and only Mutabaruka, he condemns the greed of those that keep the poor and needy poor and needy. Hussle Affi Gwaan is another sufferers’ tune with a somewhat comforting vibe. In Until We Meet Again, Hezron mourns a dear brother of his that has departed. From the 26 tracks on The Life I Live(d), the most outstanding one is Lord With You. In it, Hezron takes the perspectives of a young father facing heavy criminal charges and prays the night before his trial. Giving the example of a woman that had received a cancer diagnosis and very little time to live but survived against all odds, Hezron displays unshakeable faith in the Most High: “Lord with you/all the things are possible/you can change the unchangeable/my broken wings can fly again/I know/I know that you can do the unthinkable.”. It is a sufferers’ hymn sung with such stunning intensity that this tune might work as a self-fulfilling prophecy when that is most desperately needed. Hezron can feel the people’s pain.